Courtesy of Evelyn HatemThe author experienced environmental advocacy for teens on an epic scale in the White Mountains. I was in fifth grade when I first learned about climate change: typical pictures of polar bears huddling, icebergs melting, habitats deteriorating. I was pretty upset by the whole thing, and I didn’t understand why no one else in my class was fazed. To me, it seemed like not only a scientific issue but a human issue, and one that could change our daily lives—and our food supplies, our coastal cities, our plant and animal species—drastically. Sitting in our air-conditioned classroom, plastic pencils and water bottles surrounding us, we were falsely immune to the effects of climate change. I knew there had to be more I could do. I needed to learn about the environment and how I could lessen my impact on it. When it came to seeking out resources and educating myself, I was fearless. Around the same time, though, I was struggling to find my own place outdoors. As a kid, I felt very overwhelmed and anxious outside. I lacked a sense of adventure, and I wasn’t willing to trust in the unknown. I realized I was missing out on a lot of exciting experiences, but I just wasn’t willing to take those risks. I remember one very hot day, in particular, when my family decided to go swimming on the Connecticut River. We found a beautiful spot under a bridge, and my cousins eagerly jumped in to cool off. I, on the other hand, retreated to the bank and had to be dragged in on my uncle’s back. I could feel the current moving underneath me, images of sharp-toothed river monsters racing through my mind. In retrospect, I had nothing to fear. Any fish in the water were probably tiny. But in the moment, when everyone else seemed so happy and excited, I could barely contain my screams. All of this built up, like most things do, and eventually reached a tipping point. I realized I cared for the outdoors too deeply to have such a challenging relationship with it. I decided to push myself past my fear, one small action at a time, to pursue connections with the outdoors and with people who shared my passion. In practice, this meant saying yes to any chance I could find to go outside. Yes to diving to the bottom of the murky pond at summer camp. 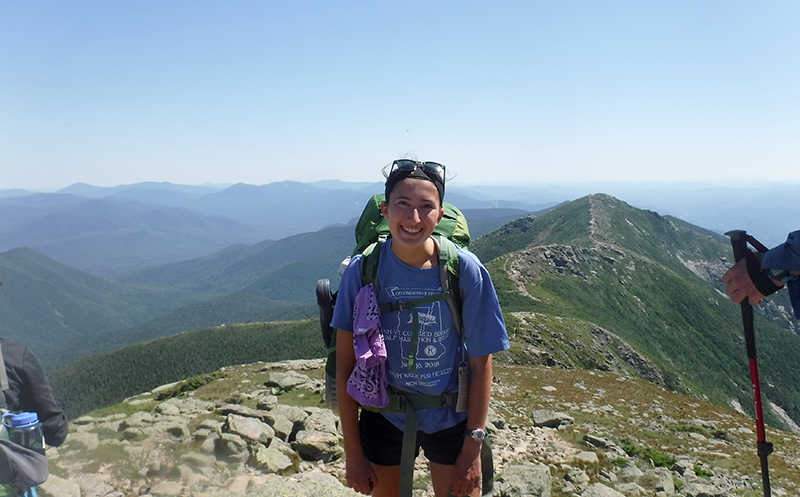 Yes to hiking the 4,000-footers of New Hampshire. And yes to spending two weeks immersed in outdoor advocacy, as one of the seven participants of AMC and The Wilderness Society’s inaugural Outdoor Citizen Skills Expedition in summer 2018. The long term is important. As lovers of the outdoors, we are obligated to respect nature. And as humans with the ability to choose what is right, we are obligated to care for our Earth, so future generations of kids can stand on riverbanks, terrified of river monsters. They might not know it then, as they shriek in fear of the unknown, but they can turn that anxiety into action. And when they do, the world will be waiting. Hear how her kinship with a loon helped a teen find her own voice. And read how a struggle with a canoe helped another teen get strong. Get the scoop on Teen Wilderness Adventures and other programs for youth.